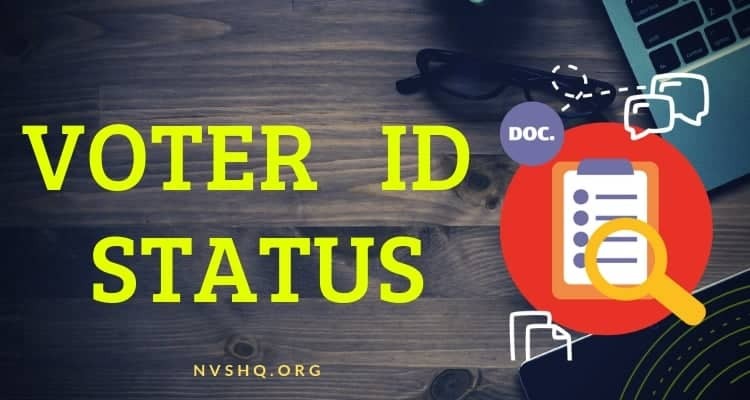 Voter ID status check online 2019 | Check election card status: Voter ID is an important document. As parliamentary elections in India are about to start next month everybody those who do not possess a voter ID is busy in getting one. Through this article, you can track voter status, check name in voter ID list and other important points. In order to be eligible for casting vote in the upcoming elections (or any election), you must have a valid voter ID or EPIC. In case, you have already applied and you want to know the processing of your Voter Card application you have to track the voter ID status with the help of reference ID. In this post, you will get detailed information on how an applicant can track the voter ID status of their electoral roll application. 2 How to check Voter ID Status 2019? How to check Voter ID Status 2019? Applicants who have submitted their EPIC application and waiting for the issue of their EPIC can track their application status. The facility is available on official service portal of ECI. Earlier, applicants have to visit the office of CEO or any other concerned office to know the status and updates related to the application submitted. But now, applicants can track the Voter id status via internet, toll-free no. and also through SMS service. Prospective voters can use toll-free No. i.e. 1950 provided by ECI to track voter ID application. They just have to dial the number and follow instructions to know how application processing has gone. Click on “Application Status” link. Enter the Reference Id and click on Track status. Application status will appear on screen. If status shows that application is under processing than voters can track the status again. SMS is also a method to track the application processing. Applicants have to type the EPIC no. in their mobile in a specific format and have to send it to the number provided by the election commission in different states. If you have applied for voter card, and your application is verified by BLO and complete, you can check name in voter list. You can visit this site mentioned below to view name. In case, voters want to replace voter ID card issues to them, then they have to fill Form 001. Form 001 can be obtained either offline from concerned department or from official portal of Election Commission. Visit official website (mentioned above) or simply click on the link mentioned below. On the homepage, click on “Application for issue Replacement Elector’s Photo Identity Card” option. Fill all the mandatory particulars, address and other required details. Click on “Submit” button and form will be submitted successfully. Click on “Deletion or Objection in electoral roll” link on front page of the website. Fill the necessary information and also information that is to be corrected or deleted. Enter the captcha code and click on send button. After submitting Form7, candidates can to check the status of application. If there is mistake in particulars mentioned in electoral roll then they have to submit and fill Form8. By filling this form, voters can make correction in the wrong particulars. Select “Corrections of entries in electoral roll” link. Select state and other details from where candidates have filled application. Fill applicant’s details, correct particulars and all the details which are mandatory to be filled. Enter the captcha code and click “submit”. Application for correction of particulars will be submitted. ECI appoint a designated officer of State Government for the supervision of election activities in states and Union Territories known as Chief Election Officer (CEO). All the matters related to parliamentary and assembly elections are managed by the CEO of that particular state. All the CEO works under the supervision of Election Commission in all the states and UTs. In order to check voter ID status, applicants can also visit official website of CEO of their state. Each state and UT has its CEO portal, where all the updates about ongoing or upcoming elections is provided. Ans.- Electors Photo Identity Card (EPIC) is the identity card issued to the citizens of the India (except Minors) by the Election Commission. It has a unique No. which is known as EPIC no. One who holds an EPIC become eligible to cast his/her vote. Ques.- Can I check application status on official website of Chief Electoral Officer of my state? Ques.- Is reference ID compulsory for tracking voter ID status? Ans.- Yes, it is compulsory to have reference Id (provided at the time of application) to check the voter ID status. For any issue, please contact the concerned BLO (Booth Level Officer) or CEO of your state. Ques.- What are the methods by which I can track the voter ID status? Ques.- Who verify claim applications and objections? Ans.- Claim application and objections are verified by the Electoral Registration Officer (ERO)/ Assistant Electoral Registration Officer of the constituency concerned. Ques.- Is enrolment procedure on throughout the year? Ans.- The last date for EPIC application for upcoming elections has gone. Generally, ECI order to revise the names of existing electorates in the month of October/November every year and the revised list of voters is published in the month of January of the next coming year. So, during this period one can lodge complaint and can also submit application for new voter ID (i.e. form 6). Ques.- What the different forms that are available for voter for solving various issues related to voter ID? Hope you find the given information beneficial. Any doubt or query related to voter ID status 2019 can be mentioned in the comment box below. Our team will try find solution. My name is Archana Thakur w/o Sh.Harkesh Thakur, resident of Flat no.204, Block A, New Generation Extension, Dhakauli, Zirakpur, Distt.SAS Nagar, Mohali, Punjab under Derabassi Assembly constituency. I have applied my name to be entered in voter list as I have shifted from Panchkula, Haryana on 17.04.2019. But I don’t have registration ID no. Pl provide me my registration ID no. So that I may be able to know my application status..Thanks Sir. Please reply whether I can vote if I have adhaar card, pan card . I am Santosh Lamani from Ward 10 Railway station road Bagalkot Karnataka. 2. Reshma Mallappa Lamai Reference No. OFV944011602, Submitted on 06-03-2019, BLO Appointed 16-03-2019, Field Verified, Accepted on 16-03-2019 EPIC Generated TDB4529582. EPIC Generated TDB4552683. ALL IS GENERATED TO THE EPIC NUMBER BUT COULD NOT TO ADDING THE VOTAR ID LIST. Please add the votar list. I am searching the epic number website is come on the record 0. When is add in name of votar list Kindly inform us. you name what are you ? I have applied for voter id in online for my family, but my application is rejected stating that “Name of Elector is already exists in the electoral roll”. My reference id is OBV209501951. My old voter id is ZIO0449652. I didn’t found my name or any details in the voter list, what should i do now. Govt had made this site to help voter but you people not giving proper information. Please do something as your duty for the nation.I have applied offline for voter card in the month of February 2019 but no any response. I have filled form No. 1 for self and wife to change voter card from Hyderabad to Nagpur and for a new card for my daughter who crossed 18 years. I applied of 24.3.2019. Will I be able to get new voters cards before the Lok Sabha election polling scheduled on 11.4.19. THIS IS A BOGUS SITE. AS USUAL WITH OTHER GOVERNMNT SITES IT DOESNT WORK. I have applied for voter card through nvsp and filled form-6. My application no is OML334304794 and in status it is showing hearing on 30.03.2019. Now what is the process of hearing and to whom to contact?